Immerse yourself in the bright lights of Bangkok, the hustle and bustle of Khao San Road and the LGBT scene in Silom Soi. The Banyan Tree in Bangkok boasts one of the best rooftop bars and restaurants in the city. Or opt to stay at the super chic So! Sofitel. Boarding the RV River Kwai on arrival into Kanchanaburi, you will be shown to your spacious twin stateroom. Enjoy the stunning views as you enjoy the local food and culture surrounding you. Visiting Pha Tad Waterfall, Sai Yok Elephant Park, Tiger cave temple and Hin Dad hot spring. En route to Hua Hin, you will have another pre-night stay in Bangkok before your road transfer to Hua Hin the next day. Finally, it’s time to relax. Hua Hin boasts a beautiful quaint beachfront with some great restaurants and nightlife in the area. Enjoy days at the beach, shopping and visiting the local national parks, including a visit to one of the biggest waterfalls in Thailand. Arriving into Bangkok, you will check into the 5* Banyan Tree hotel. You will have the rest of the day at leisure. We recommend a visit to Vertigo, an al fresco dining experience sixty-one floors above the city. Start your day with a full breakfast in the Romsai restaurant. Your tour guide will meet you at the hotel lobby to start off the Royal Grand Palace and Temple tour. The afternoon will be at your leisure – perhaps visit CentralWorld shopping centre or indulge in a massage at the Banyan Tree Spa. Today is your last day to explore the sights of Bangkok. Make a trip to one of Bangkok’s many markets, or why not visit Cabbages & Condoms in Sukhumvit? It’s not only a world-class restaurant, but they also thrive in promoting the health and safety aspects of condom use. All proceeds from the restaurant are used to fund the social development programs of PDA! Your journey starts from Bangkok to Nakorn Pathom. You will visit Tiger Cave Temple and the JEATH War Museum. Your journey then ends at Kanchanaburi where you will board RV River Kwai, lunch and dinner will be served on board with the evening at leisure. Your suite aboard the RV River Kwai is fully air-conditioned ensuring you have a great night sleep. Breakfast will be served on board while cruising up to Muang Singh. 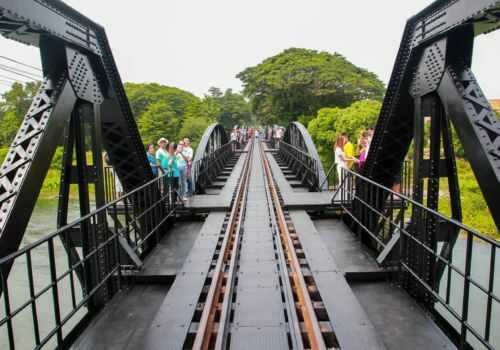 You will visit the historical national park with the day continuing with a scenic train journey to Saphan Tham Krasae, along the long wooden viaduct. We will stop and visit the elephants at Sai Yok Elephant Village followed by the evening at leisure on board. Today will start an uphill treck to Kaeng Lava Cave. The afternoon will consist of a visit to Hell Fire Pass, enjoying the spectacular views of Sai Yok Yai Waterfalls. Your final night will consist of a farewell dinner on board. Your final day on the River Kwai will start with offering food to monks at a nearby temple along with breakfast onboard. You will disembark late morning and visit the Thailand-Burma Railway Center. Lunch will be served at the River Kwai Restaurant, before returning to Bangkok for the night. Today will start your journey south to Hua Hin, a sunny seaside resort on the Gulf of Thailand. We recommend a visit to the night market featuring freshly cooked food and traditional Thai handcrafted products. Many of the fishing boats will be visible in the evening, with their fluorescent green lights catching squid for the local markets and hoteliers. Enjoy a beachside breakfast each morning. The rest of your stay is to explore or relax. Why not visit the Pala-U-Waterfall one of the highest waterfalls in Thailand. The surroundings are great for wildlife and bird watching. 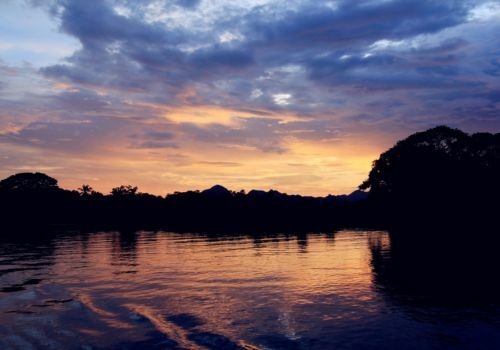 We also recommend an optional day trip to Sam Roi Yod National Park. On the way, you will stop off at an exotic fruit plantation to learn about the fruits that are sourced in the local areas. After visiting the unspoilt fishing village of Laem Sa La, lunch will be served. Why not then spend the evening at the White Locus restaurant for a traditional Thai meal? On another evening, how about fine dining at the Talay Thai restaurant this evening? Your evening will consist of listening to the musical stylings of a live band performance for evening enlightenment.